REASONABLY PRICED-FRIEINDLY CHECK-IN STAFF(I LIKED).THINGS THAT COULD BE IMPROVED -BETTER THICKER MORE ABSORBENT TOWELS!MORE EFFICIENT BREAKFAST SETUP AND THE COFFEE WAS TERRIBLY WEAK.2 THINGS THAT I FEEL COULD BE IMPROVED AT VERY LITTLE COST TO YOUR BOTTOM LINE. Great access & parking, even for the trailer. All good but no directory for the TV channels. Just laminate a card with thing listings and the guest wouldn't have to waste time figuring that out. The staff was friendly. The breakfast was fine, but set up in a way that makes it congested and difficult. The beds were fine, but the overall quality of the hotel is pretty poor. We were put in the room on the other side of the pool and next to the lobby for a two night previously reserved stay. It was very noisy due to both, and the bell on the front door can be heard all night whenever anyone goes in or out. The wall are so thin we could hear full conversations of guests in the lobby, hallway, and room on our other side. The hotel is in a decent location to get to many outdoor recreation sites easily. I stop in Green River driving from California to Colorado. 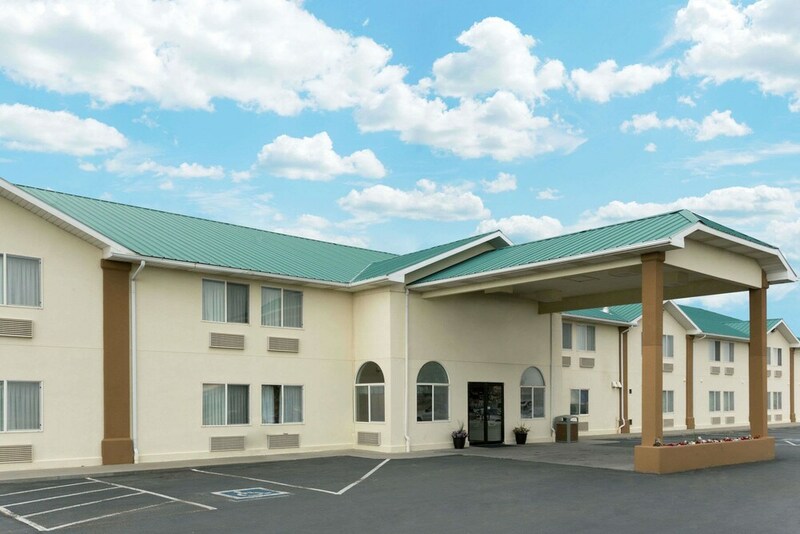 The Super 8 by Wyndham is a convenient, clean and good value place to stay. very clean, decent breakfast, super warm pool, comfortable rooms but 1 of our 2 rooms did not have a working air conditioner. Temps in mid July are near 100 degrees. The room was uncomfortable to sleep in. Room was very smelly! We never mentioned to attendant but it was rough. About 45 minutes from Arches but much more reasonably priced than those closer in Moab. Room was clean and comfortable. Not much selection in the continental breakfast, and the food was on one side of the lobby whereas the seating was on the other which made the entire lobby area a little congested. Overall, we had a comfortable visit and would stay there again. Breakfast selections were terrible. Only item with nutritional content was a banana. I choose not to add anything to this box. It is not necessary. Good basic hotel, breakfast was a bit weak but the room was clean and the bed comfortable. This was an easy on-off the freeway, which is what we were looking for. It made it easy to head out early for Arches National Park the next morning. This is at the edge of town, in a dark, out-in-the-country location. There is a gas station c-store with a Burger King right next to the hotel -- that's the only thing really close to the hotel, and it closed up at 9:00 on a Friday night -- just as we got there to check in. We took the recommendation of the hotel front desk clerk and went into town and ate at a pretty decent restaurant, the Tamarisk. Breakfast the next morning was very simple; cold cereal or oatmeal, or eggo waffles, with a small selection of drinks, yogurt and pastries. Overall, we got what we paid for. Good hotel for the price. Chose it because of location. Arrived after 9pm, so no food places were open; suggest bringing food if a late arrival. Was nice and quiet, bed was alright, good heater/ac for white noise (didn't really need it), free coffee and Continental breakfast in the morning. Gas station right across the street, easy in and out! Would stay here again. John Wesley Powell River History Museum is a short stroll from Super 8 by Wyndham Green River, and other popular attractions like Green River State Park Golf Course are within a couple of miles (3 km). This 67-room hotel has conveniences like free breakfast, an indoor pool, and free in-room WiFi. Start your day off right with a free continental breakfast, served each morning from 6 AM to 9 AM. A flat-screen TV comes with cable channels, and guests can stay connected with free WiFi. The bathroom offers hair dryers and free toiletries. Other standard amenities include a refrigerator, a coffee maker, and free local calls. Super 8 by Wyndham Green River features an indoor pool, a spa tub, and microwave in a common area. If you drive, put free parking to good use. The 24-hour front desk has staff always at the ready. Additional amenities include laundry facilities, a TV in a common area, and an ATM. We Thank You for your patronage. Glad your stay with us was satisfactory. We would like to welcome you back if you ever come our way again in the future. Thank You for taking the time to respond. Your feedback is valuable to us as it identifies areas where we can make appropriate changes. We continuously strive to meet our guests expectations and apologize for not meeting them on this occasion. We hope to be of better service in the future. Thank you for taking your time in sharing with us your feedback. We also Thank You for patronage and hope we can offer our services to you again in the future. We appreciate your feedback as it identifies areas to which we can make appropriates changes. Thank You for your time and hope to offer our services to you in the near future. The preferred airport is Moab, UT (CNY-Canyonlands Field): 31-min drive, 32.4 mi/52.1 km.